This bi-monthly publication presents concise, cogent articles on recent developments affecting insurance as well as insightful commentary and interpretations of recent cases and legislation. 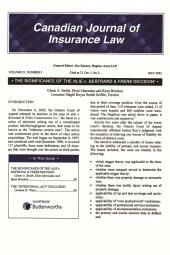 This bi-monthly publication is written with busy insurance professionals and legal practitioners in mind. It presents concise, cogent articles on recent developments affecting insurance. Insightful commentary and interpretations of recent cases and legislation will enable you to work with the law in this field in an informed, effective manner. Canadian Journal of Insurance Law is available in three convenient subscription formats: Print Only,Print + PDF or PDF only.The PDF version can be posted on your firm's Intranet so that all staff may benefit from this information-packed newsletter. Please note that the PDF version may be used for Internal Distribution only. Barbara Billingsley, B.A., LL.B., LL.M., holds the rank of Professor at the University of Alberta Faculty of Law where she regularly teaches and researches in the areas of insurance law and civil procedure. She initially joined the faculty as a full-time professor in 2001, after several years of serving the faculty as a sessional/adjunct instructor and practising civil litigation in Edmonton. She is currently a non-practising member of both the Law Societies of Alberta and the Northwest Territories and is a member of the editorial board of the Canadian Journal of Insurance Law. In 2005, she received the faculty's Tevie H. Miller Teaching Excellence Award. Professor Billingsley is the author of General Principles of Canadian Insurance Law, 2nd Edition and numerous articles on insurance law issues. 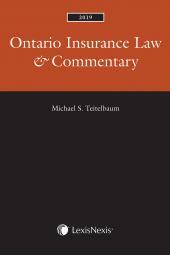 Michael S. Teitelbaum is a partner at Hughes Amys LLP in Toronto. He is certified by the Law Society of Upper Canada as a Specialist in Civil Litigation, and is Peer Review Rated by Martindale-Hubbell as Distinguished for Very High Rating in Both Legal Ability & Ethical Standards. His practice concentrates on civil litigation with particular emphasis on insurance coverage and policy interpretation on behalf of both insurers and insureds, as well as the defence of professional, governmental and product liability, environmental law, personal injury and defamation. He has been included in The Best Lawyers in Canada for the specialty of insurance law from the 2009 to 2018 editions, and in the 2011 to 2018 Canadian Legal Lexpert Directory as a leading practitioner in "Litigation – Commercial Insurance". He is also listed in the 2018 edition of Who's Who Legal: Insurance & Reinsurance, and in Who's Who Legal: Canada 2017.